BCORMA has sent a letter to current Government Ministers and the Premier outlining why the Government implementation of the ORV Act vehicle registration needs to be put on hold. There are serious issues in how this is being rolled out, and we now have less than two months before mandatory ORV registration in BC. BCORMA needs everyone's' reports on their attempts at registration and any information that was provided by the broker(s). Please reach out to anyone you know with a dirt bike, quad, SxS, or sled and that have attempted or been successful under the volunteer ORV registration program. BCORMA is advocating to BC Government that decals are the only viable solution for ORV vehicle identification under the ORV Act. Please read our position brief, and provide copies to your MLA. It is very important that MLA and Ministers hear the perspective from the riding community. 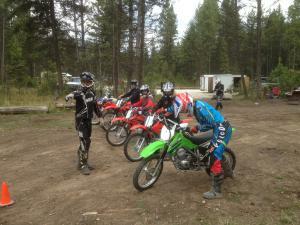 This is directly affecting us, and we are the experts because we ride and experience dirt bikes and other ORV. Pass along to other riders, club members, and your MLA and their Assistants. Call to Action for all Canadian Motorcyclists!!! Please complete the MCC Online Survey. Call to Action for all Motorcyclists!!! Please click the logo and complete the MCC Online Survey. Here is a bullet list to help guide you in meeting your MLA successfully. It is intended as a guide, not a cookbook to follow methodically. Pick the bullets that apply. Provincial Government's voluntary ORV registration and the date for mandatory registration is now public! 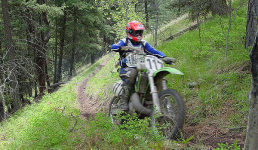 The ORV Act was passed in Spring 2014. The Government is now bringing in voluntary registration, with mandatory registration in 2015. The voluntary registration period started on November 17, 2014 and mandatory registration will start on June 1, 2015. Members clubs of ATVBC (Right Nuts ATV) and BCORMA (DualSportBC / GVMC) had over 40 volunteers donate over 250 hours this past weekend to prepare the area for use by all off road motorised users.